Since the spring, Rachel’s Network has been helping mobilize efforts to fight the US-Mexico border wall, and supporting coalition-building and education through the Sierra Club. Diana Hadley, who chairs our Borderlands Working Group, lives in Tucson and planned a three-day event with grassroots leaders working for fairer outcomes for immigrant populations and safer, healthier environments for border communities. The event kicked off with dinner at the Mission Garden, a living agricultural heritage museum interpreting 4,100 years of agricultural history in the Tucson basin. Members walked through the museum, which was only an empty dirt lot several years ago, to see a thriving garden full of native fruits and plants. After dinner, members attended a forum hosted at the Southern Arizona YWCA featuring Sierra Club Borderlands Campaign coordinator Dan Millis, Humane Borders board member Dinah Bear, Friends of the Sonoran Desert board director Jan Schipper, Tohono O’odham Mike Wilson, and Wildlands Network director of Mexico program Juan Carlos Bravo on the scope of issues related to the border wall including disruptions in wildlife movement; waivers of environmental laws; human rights violations, and more. The next day, Rachel’s Network visited a sustainable farm at Santa Fe Ranch led by executive director Antony Sedgwick and manager Dean Fish to hear about their educational programs in the Santa Cruz River Valley. These programs include agricultural literacy, animal therapy, as well as leadership and interpretive training through their Anza Club, a program created in partnership with the National Park Service. The ranch focuses on three tenets of sustainability: economic, social, and ecological. 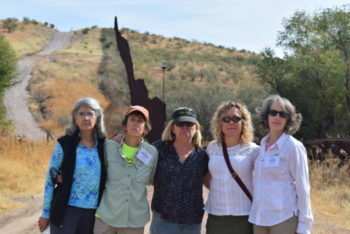 Members then visited the Arizona-Mexico border to see the border wall structures up close and learn about border militarization, border security, and immigration. At the Pimeria Alta Historical Society, there were presentations from Santa Cruz County Sheriff Tony Estrada, who works with municipal, state, and federal agencies on border issues; Lance Jungerman, president of the Fresh Produce Association of the Americas, who shared how border security impacts environmental health, food waste, and emissions at the US-Mexican ports of entry; James Martin from Wilson Produce on his family’s company values of regenerative farming, visualized in a mural and animated video; and Rev. Sean Carroll of the Kino Border Initiative, on his organization’s commitment to fostering bi-national solidarity on migration between the United States and Mexico through education, research, advocacy, and assistance to immigrants. Immigration attorney Luis Fernando Parra shared one of those stories: a significant case involving the prosecution of a border patrol agent for the murder of a young Mexican man in 2015. The murder occurred during a border patrol hiring surge, leading to many under-trained agents. The case was the first time in history when a US border patrol agent was charged with a cross-border shooting. The next day, members connected with Valer Clark and Jose Manuel Perez of the Cuenca Los Ojos Foundation, an organization which conserves sensitive land and restores the biodiversity of the borderland region. Members traveled to ranches on the Mexican and US sides of the border to see how Cuenca Los Ojos works with scientists and researchers to study the region’s ecosystems and prevent soil erosion. William Radke, manager of the San Bernardino Wildlife Refuge, explained how the US Fish and Wildlife Service works with important nonprofits like the Cuenca Los Ojos Foundation restore water levels in the San Bernadino Valley and monitor habitat protection and rare species recovery. One of the many challenges in the region is managing water – During July and August’s monsoon season, water rushes to the ciénagas (a type of wetlands). Structures, such as gabions, berms, and trincheras, have helped to slow run-off, cache sediment, aerate soil, slow erosion, and clean water, in order to build up riparian areas and restore watersheds. The program concluded with a presentation of photos taken through wildlife camera traps by Keith Shallcross, as well as an overview from Laura Norman of the US Geological Survey on how border structures, combined with effects of climate change, negatively impact the region’s hydrology and socio-economics. She explained how the timing is ripe to establish a restoration economy through ecosystem services that can provide quality jobs in conservation. The national image of the US-Mexico border is a dusty landscape devoid of life. Anyone visiting the border in Arizona will learn how wrong this is. Vibrant communities, cross-border cooperation, and rich biodiversity exemplify everything we have to lose by building more walls, in Arizona and elsewhere. To learn how to support efforts at the border, visit noborderwalls.org.